Best Lower Chest Workout #1 Routine: Shape Your Pecs Fast! Most people find it quite difficult to build the lower part of the pec. This is why we have decided to provide you with the best lower chest workout. Most of you are looking for different routines to try. Give this lower chest workout a try to see if it works for you. I’ve also added a few tips on how to properly engage the chest muscles during an excersise. With this lower chest workout, we’re going to obviously prioritize the lower part of the chest muscles. This lower chest workout is made up of 5 different excersises that will help you grow your lagging lower pecs. 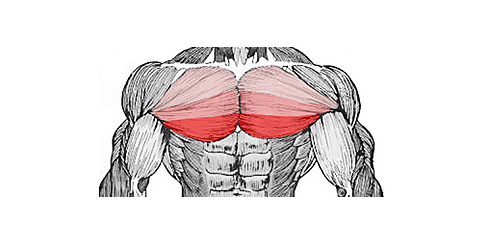 If you’re lower chest is lagging, you want to start off with a movement that directly targets the lower part of your pecs. A decline dumbbell press will really hit your lower chest when performed correctly. Personally, I prefer dumbbell press over bench press because you’ll be working the pecs individually. Your weak side won’t be able to compensate for your stronger side. On this first exercise, you’ll be going pretty heavy and performing 6 to 8 reps.
As I mentioned in my chest and tricep workout article I think it’s important to start your workouts off with a compound movement. After hitting the decline dumbbell press, we’re going to move on to a decline dumbbell fly. With this excersise we’re going to focus on a good stretch and contraction. We’re not going to go as heavy as on the dumbbell press. It’s important to get the form right on this one. Grab a weight you have no problem performing to 10 to 12 reps with. Don’t look at the weight, focus on squeezing your pecs during this exercise. There is a reason why the cable crossover was added into this lower chest workout. It’s because it pretty much eliminates tricep activity so you can focus on the lower chest. It’s kind of the same idea as with the decline dumbell fly. Get a good stretch and dont go to heavy, you want to feel your chest doing the work. If you go too heavy your other muscles will try to make up for it. This is something you dont want, keep the weight moderate. Perform 4 sets of 10 to 12 reps and get a good squeeze. Now that we’ve prioritized the lower chest, we’re going to perform a regular machine chest press. Your chest should be pretty pumped up. Perform 3 sets of 8 to 10 reps at a moderate weight. Try to get as heavy as possible. 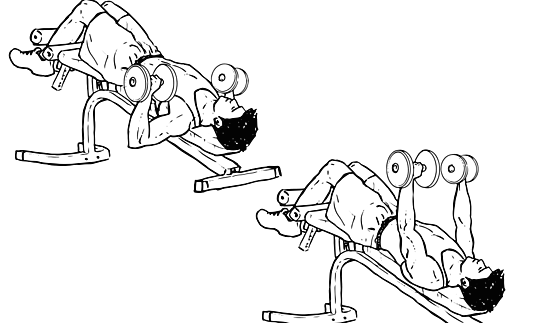 If you don’t have a machine chest press available, regular dumbbell press or bench will also work. This excersise will target the whole pectoralis major. Don’t get me wrong, the others do as well but they emphasize the lower part of the pec. Last but not least is chest dips. You’re going to do 4 sets until complete failure. Dips are great for hitting the lower chest, make sure you have good form on this one. The trick is to lean a bit forward and putting the focus on the chest instead of the shoulders and triceps. You also want your elbows to be slightly wider than your shoulders. By doing so, you’ll put a lot more emphasis on the chest during dips. In my opinion, dips should be in every lower chest workout. It took me a while to figure out how to properly activate my pecs during dips. Once you know how, you’ll get an amazing pump and you will help grow the lower chest. If you’re unable to do dips, a machine dip also works. If that isn’t available you can also focus on the negative part of the movement. Additionally, you can also consider using different muscle building supplements. They might be able to help you with growing the lower chest. Remember, results don’t happen overnight. Make sure you are eating and resting enough. Most people overlook the importance of rest and diet. If you guys would like me to publish a different lower chest workout to try please let me know.